In the April 1988 Arrivée, Bernard Mawsonwrote an article proposing that AUK should have it's own equivalent of Paris Brest Paris. Land's End-John o'Groats was the obvious classic route but the practicalities and expense of getting riders to/from the start/finish meant that an alternative was needed. Eventually he came up with London Edinburgh London. In the 1989 spring Arrivée, there was no mention of LEL other than a pointer to the entry form in the middle pages. There was no advice anywhere about equipment, no suggested packing lists, no proposed ride strategies. You just had to turn up and ride it using any experience you might have gained on 600s or in a few cases PBP. No-one knew what the distance was; estimates varied between 1250 and 1400. Even at the end no-one was quite sure! The event started in Doncaster at the Mencap Centre and entry was £10. 29 riders started and 26 finished, all were male except Sheila Simpson and all were on conventional bikes except for 3 trikes (Pete Gifford, Dave Pountney and Ron Sant). The event was sponsored by Lonsdale Road Fish Shop! Bernard had to wait until the last riders were through Carterway Heads for the second time before driving as fast as he could down the A1 in his Lada to get to Thurlby as Graham Moult (who wanted to do a time) had carried on through Doncaster without stopping. Jimmy Green completed the ride, but his brevet card visited neither Edinburgh nor London. 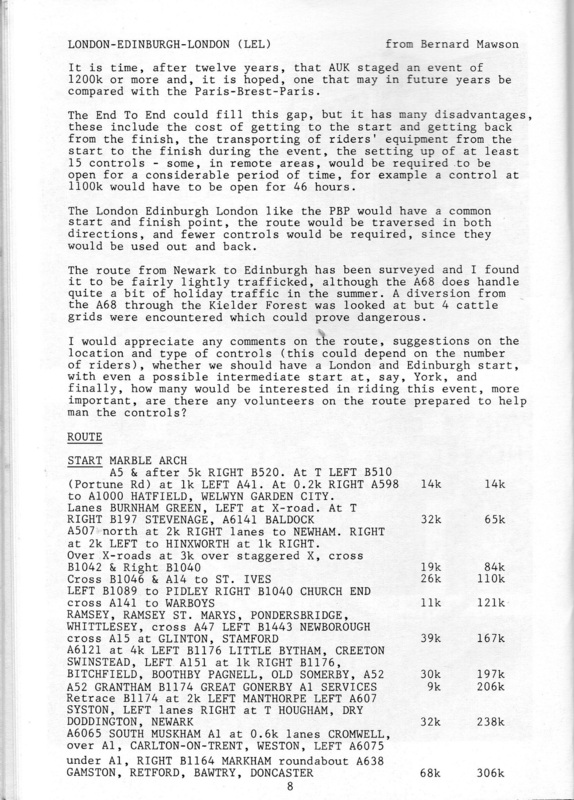 He left it at the control at Byrness going north (forgetting to pick it up on his way south, so I had to chase him down the A68 with it) , and at Thurlby going south (along with his maps and routesheet, which meant he never found the Potters Bar control). Bob White rode from Portsmouth, rode LEL, then rode home. All on a budget of £5 (or so he claimed!). While John Spooner was sleeping at the side of the road in Yorkshire, an ambulance stopped to ask if he was OK. Somewhere in the Scottish borders, a police car had left him undisturbed, but asked other riders nearby. Whilst the ride was on, Fliss Beard was killed riding a timetrial on the A38.